Our hearts and thoughts are with the family at this difficult time. Joseph DiLeonard was induscted into the Steinmetz Hall of Fame in 2014. You can read his entire bio here. 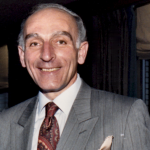 DiLeonardi’s wake will be held from 3-9 p.m. Wednesday at Cumberland Chapels, located at 8300 West Lawrence Avenue in Norridge, Ill. His funeral mass is scheduled to begin at 10 a.m. Thursday at Holy Name Cathedral, located at 730 North Wabash Avenue in Chicago. his internment at Queen of Heaven Cemetery and Mausoleum will be private.